I’m sure you’ve heard about them – Christian sports leagues, Christian book clubs, and even Christian motorcycle clubs. An idea born out of the gradual de-Christianization of America, it all sounds good, doesn’t it? Yes, until we test it against the witness of the Bible. Jesus spent a lot of time with the Jews of his day, in the synagogue, at the table, along the road. But he did not do so exclusively. He ate and healed and taught Jews and non-Jews alike, too. He taught us to be salt and light to those around us. So, why have so many come to believe that this means only for other Christians as though we’re in a Christian bubble, a term coined by Rev. Trevor Lee? The mission statement of the United Methodist Church is “To make disciples for the transformation of the world.” Exactly how can we transform the entire world if we contain our existence within a Christian bubble? I understand the arguments – protect our children from unChristian influences, keep our eyes and ears from seeing or hearing unChristian words or images, create a little part of the Kingdom of God right here on earth so we don’t experience the other side of things. It makes all that is not Christian sound like it has much more power than than it does. What about the power of the gospel and its influence in the lives of people? What about the power of the Holy Spirit to protect us as we learn to love our neighbors? What about inviting everyone else to the inbreaking Kingdom? Otherwise, we have inadvertantly stepped into the same hole that some of the Pharisees of Jesus’ day did as they became so enthralled with every minute detail of the law, they had no room for mercy, kindness, generosity or grace. I know we might be exposed to some stuff hanging out in the world outside the bubble but we can’t reach beyond our Christian friends if we don’t. So, the next time you shy away from those who aren’t in the Christian bubble, think about what would have happened to you if Jesus had done the same thing? This entry was posted in Life and Faith and tagged bubble, Christian, Jesus, Kingdom of God, unChristian. Bookmark the permalink. 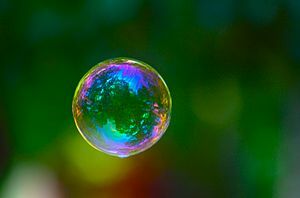 1 Response to Bubble Christians?